Nutrition Facts do not include optional ingredients. 1. Scrub potatoes and pat dry. Combine cheese, parsley, paprika and salt in a small bowl; set aside. Cut each potato crosswise into 1/4-inch thick slices, cutting to, but not through, bottom of potato. Allow potatoes to stand in ice water 10 minutes. 2. Combine margarine, lemon juice and lemon rind in a 1-cup microwave-safe glass measure; microwave, uncovered, at HIGH 30 to 40 seconds, or until margarine is melted. 3. Drain potatoes and pat dry. 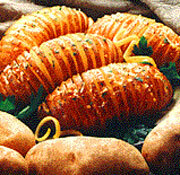 Arrange potatoes, cut side up, in 12x8x2-inch microwave-safe baking dish. Brush tops and sides of potatoes with margarine mixture. Cover with microwaveable plastic wrap and microwave at HIGH 12 to 14 minutes, or until tender; rearranging potatoes every 6 minutes and brushing with remaining margarine mixture. Sprinkle potatoes with cheese mixture. Let stand, covered, 5 minutes.